In this book, Brad Powell outlines his strategies and lessons learned from leading change at Temple Baptist Church (now NorthRidge Church) in Detroit, Michigan. Decades ago, Temple Baptist was a trend-setting church that was recognized nationally in the 1969 edition of Elmer Towns' list of the "Ten Largest Sunday School Programs." But the city of Detroit fell on hard times in the years that followed. With the rise of suburban lifestyles and the loss of downtown glamour, the churches of Detroit found themselves needing to make a change - that included the historic Temple Baptist Church. Powell became the Senior Pastor of the church in 1990, and this book is a broad-stroke distillation of his lessons, experiences, and advice to church leaders who find themselves in similar situations today. In his own words, Powell says, "This book is about changing the church in its conduct (practice) without compromising the character (principle) of God's truth. 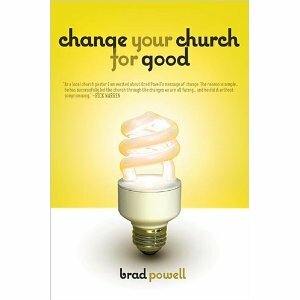 It's about allowing the church be a clearer reflection of who God is and what He does" (p. 76). He connects his advice with various verses of Scripture, but it feels like he "backs into" a lot of those verses (i.e. he started with his point and then searched a concordance to find a verse that says something along the same lines). That doesn't mean his points are bad. In fact, most are quite good. It just means that he could've communicated his words of wisdom without artificially bolstering their apparent authority with random references to the Bible. Part 1 is about the church as Powell thinks it should be. Part 2 is about leadership and change. Part 3 is about naming and proclaiming the vision. Part 4 is about investing in people and persisting through adversity. Part 5 is about seeing the big picture.